Video of the incident showed the young girl sitting down off Steveston's docks in Richmond, British Columbia before being suddenly dragged under the murky water by a male California sea lion last Saturday. The terrifying video was quickly shared by tens of thousands of people online. "There was somebody beside them that was trying to feed them. Also, they weren't trying to take pictures or anything," the girl’s father told ABC News in an interview. The girl sustained a 5cm (2 inch) by 10cm (4 inch) wound on her lower body and was taken directly to B.C. Children's Hospital where she was prescribed antibiotics to fight any potential infection. "Only thing I care is God, she is safe. God, I didn't miss out anyone from my family at that moment. I could have gone organizing a funeral by now rather than doing interview," he said. Aquarium spokesman Deana Lancaster told ABC news that staff members had been in contact with the family following the incident to discuss the dangers associated with the ‘seal finger’ infection. Mycoplasma bacteria that live in the mouths of seals and sea lions can cause the painful and potentially serious condition. These bacteria are difficult to fight as they do not possess a cell wall which is the main target for the most common forms of antibiotics such as penicillin. Symptoms of the condition include cellulitis, debilitating joint inflammation and even edema of the bone marrow. Historically, ‘seal finger’ was treated by amputation, though thankfully antibiotic medicine has greatly improved to render such drastic measures largely obsolete. 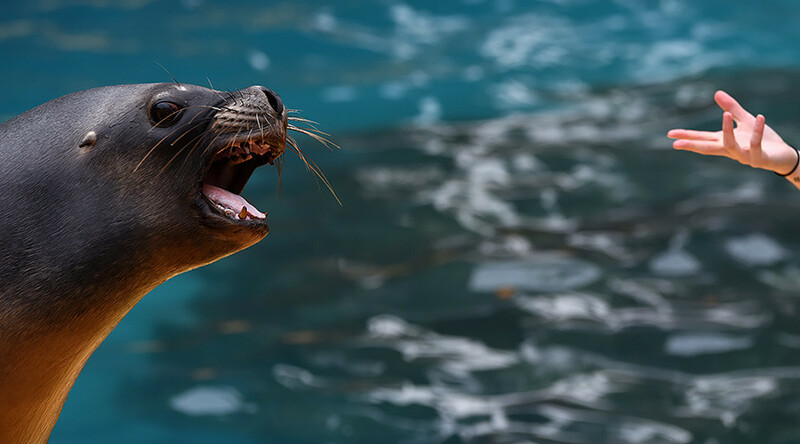 "If any member of our animal care team receives a bite from a seal or sea lion, they take a letter from our vet with them to the hospital, which explains that the infection is resistant to some antibiotics," Lancaster explained to ABC News.